In some scenarios, you may have to activate a feature for all sites or site collections in SharePoint. In my case today, I had to activate "Open In Client" feature of SharePoint to disable browser based editing for all site collection in a SharePoint web application. How to Activate a Feature in SharePoint? 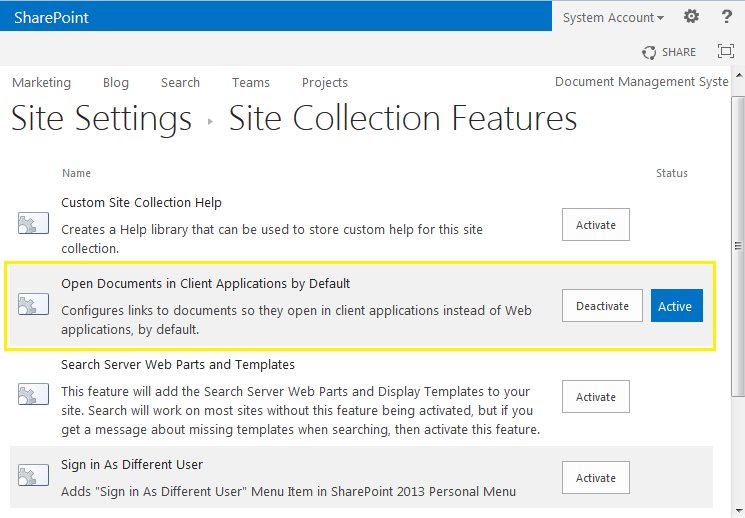 To activate a site collection feature from SharePoint web UI, You can navigate to Site settings >> Site Collection Features >> Click on "Activate" next to the relevant feature. Pretty straight forward and easy enough through the UI, isn't it? Well, If you have to do the same for a dozens of site collection in the web application, PowerShell is the perfect solution. This PowerShell script activates feature on all site collections. Consider a scenario, where you have to activate a site level (web) feature on 100's of sites under a site collection, which is quite common. In my case, I had to activate Nintex Workflow 2013 feature on all sub sites within a particular site collection. Write-Host $FeatureID "is already activated at " $Web.Url -f "Blue"
Write-Host "Feature has been Activated on "$Web.URL -f "Green"
Write-Host "Feature doesn't exist:"$FeatureID -f "Red"
This script activates feature for all sites in SharePoint.